"The differential is a Dana M86 unit featuring a wet mutilate clutch" – I hope you meant multi-plate not a mutilate clutch! Hmm, we don’t remember the clutch being mutilated but, yes, it was a multi-plate! Error now corrected. Any high-performance workshop should be able to do it - but the conversion will likely cost quite a bit by the time you add the cost of new pedals, gearbox, clutch and numerous other parts. We suggest that you trade in your car for one with a manual gearbox. Re a question by Peter Tcherveniakov (“Merc Mumbo”) at Response... For power ratings of W126 5-litre+ sedans and coupes go to the W126 website - www.mb-w126-club There were multiple power variations on this series - including an optional non-catalyst version available in Europe, the US version (strangled) and more. And, of course, many examples have found their way here as grey imports. 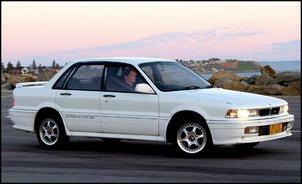 I've been a reader for a while now and have been influenced by your article on the Galant VR4 (Australia's Best Value Performance Car) to go and actually buy one! The questions I have are... Installing a 3 inch turbo-back exhaust and improving the air intake will increase performance - but how will this impact fuel economy? With the ever-rising cost of fuel, this is an issue for me - especially as I'll have to fill up using more expensive 98 octane. Your article states the VR4 has ABS but some other sources suggest that it does not. How can I tell if the car I receive is equipped? In a side-by-side comparison it’s fair to assume fuel economy will be enhanced. However, you’ll want to keep an eye on mixtures and idle speed control after mods. A richer post-modification mixture and a surging idle speed (a common problem for VR4s) will offset any economy improvement. ABS is fitted to all Australian-spec VR4s but apparently not all Japanese import versions. Have a look under the bonnet near the passenger’s side inner wheel arch – if you can see a metal box with several small diameter metal tubes connected, that’s part the ABS system. I just subscribed to this magazine and the amount of information I get from it is enormous - I wish I subscribed to it earlier. Keep up the good work! Oh yeah, I’ve got a question... I’m currently building my CA18DET-powered Nissan 180SX on a budget. I’ve already installed a bolt-on aftermarket intercooler (260 x 200 x 70mm), which is still a side-mount thus eliminating expensive custom pipework. I have also installed a bigger fuel pump (which flows 264.4 litres per hour at 43psi and 14V) together with a bigger turbo (a Garrett T28 ball bearing from an S15 Silvia). I still run the stock ECU and injectors (370cc if I’m not mistaken) at the moment with the boost set at 0.6 Bar. In your opinion, is my fuelling and engine management system adequate to support my mods? I was wondering, with all your recent research into aftermarket supercharging, whether you know the maximum amount of power that can be extract from the crank pulleys of the typical mid to large sized vehicle? I want to run a hydraulic pump from an electric clutch, but to get the most from my system I need at least 60 litres per minute at 2500 psi. According to my formulae, this means around 19hp (14kW)! Does that sound possible or should I limit myself to less power? The typical vehicle for the application will be a large 4WD, such as a Nisan Patrol or Toyota Landcruiser. Thanks for any help you or the readers can provide and thanks, as always, for a great daily read! It’s impossible to determine the maximum power that can be extracted from the crank pulley – there are simply too many unknowns and variables. But, to answer the bit you’re really interested in, we reckon a 6-rib belt should be fine for your 14kW drive application. An adjustable tensioner may be also needed. The information I am chasing is the modification to inlet and exhaust mentioned in the article. Do you have a detailed description of what is required and any other suggestion for the car? I have purchased a Celsior but am unable to locate articles on modification to engine. Your help or direction to where I would be able to source this information would be much appreciated. 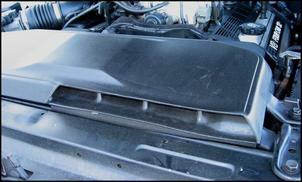 We do not have any details specific to modification of the Celsior’s intake and exhaust. However, we suggest using a manometer at various points of the air intake to find where you can improve airflow. The same applies to the exhaust – install a temporary gauge fitting at various points of the exhaust and measure backpressure. This will tell you how much potential there is using an upgrade exhaust and, more specifically, what part of the system is most restrictive. Do an AutoSpeed search under “manometer” and “backpressure” to find relevant articles. We imagine the Celsior would also respond well to engine management mods. An aftermarket interceptor (capable of modifying a frequency signal) would be a cost-effective solution. Although power is useful in drift, this is kind of a misleading statement. Top level machines often make quite some power but it isn't a necessity. A Queenslander named Josh Young does quite a good job in his naturally aspirated 4A-GE AE86 Toyota Sprinter and, even at a world-class level, drivers such as Katsuhiro Ueo and Tetsuya Hibino can easily be called some of the best and most impressive drifters in the world - with only 150-200ps (110 – 147kW) at their disposal. I just thought I’d point this out since it seems to be a misconception on the part of some newcomers to the sport (ie most Australians at this stage) that drifting is a kind of moving burnout competition... Nothing against the car or its aims of course (in the hands of Beau Yates that STi is a very impressive machine), but my own aims for my SR20DET Nissan Gazelle drift car is an even 200 rear-wheel kW, which should give a nice mix of power and response. Anyway, apart from that it's a great article - good to see something different. 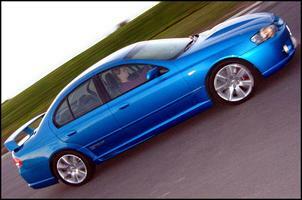 Although it is still a WRX - I think you must have had every mod’d WRX in Australiain the magazine now (just kidding)! I look forward to seeing more great articles. In the article Breathing Deeply you mention extrude honing. I have been trying to do research on it, however, I haven’t been able to find a suitable webpage on where to find one who does extrude honing in Australia and how much it costs. Could you please help me out here? Can any readers offer some Australian contacts for the extrude honing process?